Life With the Bauer Bunch: "I NEED to swing." Hi everybody! This weekend Nana and Grampa came up to visit for a quick break in what is turning out to be a very busy summer. While here, they gave Nathan an early birthday present - his very own swing set! 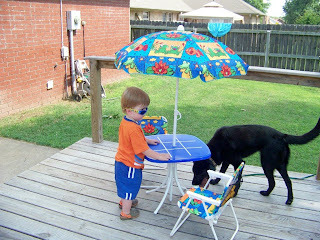 He absolutely loves it and has been out there every day since it was put together. The hard part now is convincing him to come back inside. This method usually consists of juice and some sort of snack. 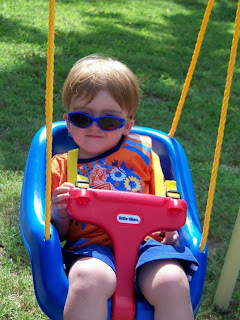 :) I just wanted you all to see how cute he was on the swing set, especially while sporting those cool guy shades. Have a good week!